You don’t have to be the world’s best rock climber to go abseiling off a rugged cliff next to a massive waterfall. But you most certainly need to be aware of the safety guidelines that entail in order to have a fun and bruise-free time. The hardest part of abseiling is the rocks, which is why you must protect your knees, elbows and face at all times. Even the most advance of abseilers can’t prevent a spill here and there on their adventures but the important part is knowing how to fall. Always look where you are stepping before you step; this might sound like common knowledge but one can become preoccupied with the scenic views or the harness to notice where your feet are leading you. If you do slip, be sure to keep your legs out in front of you to prevent any damage to your face. As a beginner abseiler you learn how to trust the ropes with your weight. It is understandable not want to trust a few ropes with your entire weight, but those ropes are a lot stronger than you give them credit for, some of them being capable of holding over 2 tons of weight. When begin your descent you will have to situate all your weight to where you are leaning back on your harness; you will feel like your body is horizontal. Don’t lock your legs when you are descending; they should be bent and your body should be positioned as if you are sitting in a chair. This will make it easier to maneuver and it will prevent you from slipping. If you do get in a snag, remaining calm will be essential. When you are dangling in air hundreds of feet above a river, losing your mind is the last thing you want to do. Firmly call out to your guide above and they will come down and fix whichever snag you are in. If you are afraid of heights, abseiling might be the activity that helps you overcome your fear; you will be too busy focusing on the where you are stepping and the picturesque scenery to focus on how high you are dangling above the surface. Remember to take your time when doing this sport; you are not competing against anyone and if you don’t take your time you might get hurt or even worse, miss out on all the sights. 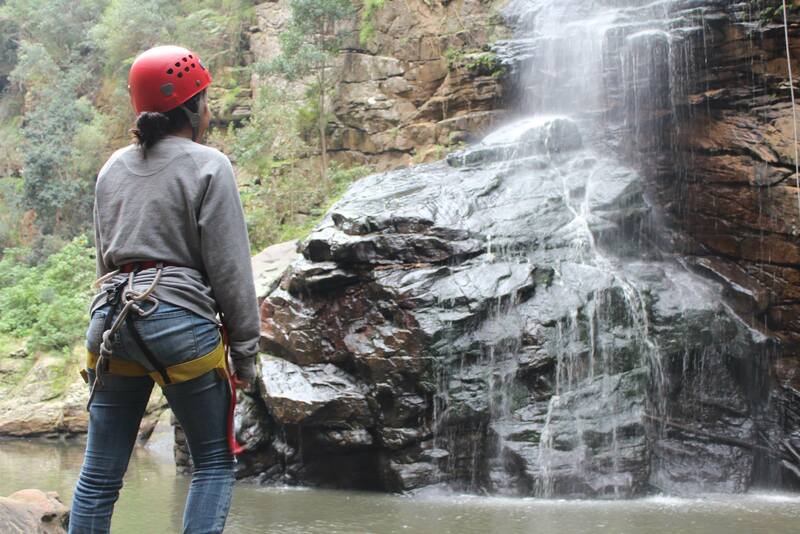 Abseiling will test your athleticism but also bring you to scenic views of waterfalls and canyons that will take your breath away. We had to abseil down the waterfall and drop into a kayak! That little gray speck is me. Right after I ate rocks!